When hubby and I first moved to North Dakota, we decided one of the best ways to break up the long, cold and dark winters was to plan a trip somewhere warmer and with a race we could train and look forward to, that coincides with our January anniversary. Last year, we set off for Maui, which was amazing! This year, knowing we would be purchasing a treadmill soon, we opted for a slightly less…extravagant vacation, and decided in late October that we would take a quick weekend away to Orlando Florida to run the Disney World Marathon the first weekend of January! Now, let me preface this by saying I never thought I would do a RunDisney event. Not because I am against them in any way – in fact, I have heard nothing but great things about the events – but we tend to gravitate to trail races more now (I only did one road race in 2016) and let’s face it, Disney events can be a little heavy on the wallet. BUT, the timing was great, and we decided it looked like a fun escape from the NoDak chill. And who doesn’t love Disney?! So, tickets were booked and we had our sunshine trip planned and something to look forward to. Thus, the 2017 January double header was conceived! We were up at 0300 am for our early flight, and after a day of travel, we arrived in Orlando on Friday afternoon. We hopped in the rental car, did a quick luggage drop at our hotel and changed into shorts (the 75 degree temps felt heavenly, and sadly, would end up being short lived) and went straight to the RunDinsey expo at the ESPN Wide World of Sports venue. A quick hit and run of the expo and bib pick up, and we headed to our hotel for a quick bite to eat.Then alarms were set and it was light’s out; another 0300 am wake-up awaited us. Like an excited kid eager for Christmas, I woke up at 2:45. I decided hubby needed to get up, too (sorry, babe!) so pretty soon we were both bumbling around the hotel room getting ready. It was then I saw the social media updates that RunDisney had canceled the half marathon that day due to weather. Was our trail race going to be canceled as well? Figuring trail races tend to have fewer incidences of weather cancellations, and having no word that the race was anything but still going on, we left the hotel at 3:45 for our 90 min drive to the start. As soon as we started driving you could see the strong winds whipping around and incredible shows of lightening in the skies. If nothing else, the weather was not going to be boring today! Upon finding the start of the race, we quickly picked up our bibs and t-shirts and headed back to the car. The rain and wind were really starting to pick up now! Within minutes the Race Director announced there would be a 30 min delay (now a 6:30 start) as a very strong weather cell was on its way through the area (complete with tornado warnings). And that weather cell did not disappoint! It began to POUR rain with fierce winds, and all we could think about was what a muddy and fun this was going to be. And as quickly as it came through, it was gone…and it was suddenly 6:30 and we were off to run through 32 miles of the Florida woods for the day. The race consisted of one 2.2 mini loop to start, followed by three 10 mile loops, with manned aid station at the start and 5 miles into each loop, and 2 other unmanned water stops on the course. The temps were cooler from the day before, and with the wind and rain, I decided to start the event with my Patagonia Houdini jacket. This lightweight shell proved to be too warm at the start of the race, so I ditched it in my drop bag after the first two miles. I guess I have become accustomed to colder ND weather after all! Part of the reason I was SO excited to run this trail race was to try out not one, but TWO new pieces of gear! I had recently gotten my Orange Mud Endurance Pack (after I had sworn off bladder packs) and my Topo Athletic Terraventure trail shoes. Fun Fun! I will be doing a separate write up on the Orange Mud Endurance Pack soon, but just know this thing is a game-changer! So light, so comfortable, and with so much storage! Plus, I loaded my bladder with Carbo-Pro and Enduropacks, and I didn’t need to refill once during the event. Talk about time saved and hassles avoided! No doubt about it, this is my new GO-TO pack for all of my longer trail races this year. Two enthusiastic and dirty thumbs up! Now, on to the Teraventures. I freakin’ LOVE this shoe. It is everything I have wanted and that I love in a trail shoe; light, responsive, with just enough cushion but plenty of ground feel. Trust me…this shoe is amazing! I enjoyed 32 muddy, slippery, sandy and – at times – rooty trails, and these kicks performed like champs. Phenomenal grip, and that wide toe box meant my toes were happy campers…not one blister to be had! (and if you know me, blisters use to be one of my biggest limiting factors with races). So yep, this is absolutely my go-to trail shoe! Want to try them for yourself? 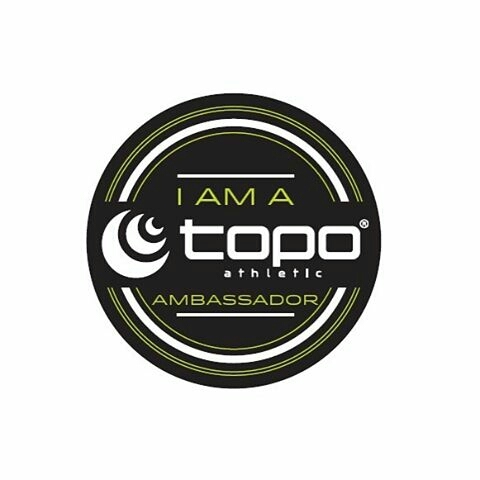 Use code TOPODRTYRUNNER20 for 20% off! POW! Rain, wind and mud! Must be time for a trail race! In a nut shell, this race was more of a fun way to see where I was at fitness wise more than anything. I knew I had a marathon the next day, so my goals were to have fun, not roll an ankle, and enjoy the trails! And did I ever! Right around mile three I connected with two runners, one of which I happen to follow on Instagram; we had a nice laugh how we happened to bump into each other during the event, then the three of us enjoyed the first 10 mile loop together. We even encountered a tortoise in the middle of the trail, which I promptly moved so he wouldn’t get kicked or stepped on. Near the end of the loop we formed a conga line with a bunch of other runners, and it’s always fun to listen in on all the different conversations. I stopped briefly at my drop bag after that loop to drop off my flashlight, and back out I went. I ended up running the rest of the race on my own, passing runners here and there (there was also a 25k, 100k and 100 miler going on at the same time). About two and a half hours in it started to pour rain, with strong winds blowing about. My clothes stuck to me and I literally looked like I had just jumped out of the shower, I was soaked to the bone. But this is what makes trail running so much FUN! The weather, the mud and the dirty messiness of it all! I had picked up some RunGum at the Disney Expo the night before, curious as to how I would like it. The product is gum with caffeine to provide a little instant energy boost absorbed in the mouth (vs. ingesting a product) and I used the mint flavor. I planned on utilizing it on my final loop, and by mile 14 I had popped the two pieces in my mouth for a nice little boost. I definitely will be trying this product again! I finished this run in 5:34, grabbing third place female. I was pretty excited, considering my training leading up to this event and my plans for the weekend. This is a fabulously low key, well organized and fun event – if you are in central Florida I recommend you check it out! I chatted with fellow runners (and met an awesome fellow Orange Mud Ambassador, Jodi, out from Canada to crew for her runner friend) and then saw hubby in to the finish. We dried off, and headed the 90 min drive back to Orlando, but not before stopping to get cast-away clothes from Goodwill for the start of tomorrow’s race (they were calling for record low temps – I thought we’d escaped that nonsense?!) and Chinese food take out. Because, priorities. Ready to rock race number two in the morning! Do you like running in the rain? Have you even done back to back trail and roads races? What’s your favorite post race meal? « Older Post 2017 – The Year of YES	» Newer Post January Double Header – Part Two!